NOTE : I have updated this story in light of Boston 2024’s response to the Brattle Report. See below for updating. 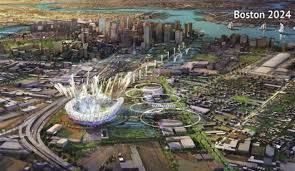 We now can read the much-awaited Brattle Group’s report on the risks involved in Boston 2024’s Olympic Games bid. At 10.30 AM this morning the e-mail arrived from the Governor’s press office. There it, was : the Executive Summary, which I have now read, and the full report, which I’ll read eventually. There’s enough in the Executive Summary to tell us much about the “2.0” Bid. The Brattle Report evaluates four separate areas of revenue and cost : ( 1 ) revenue ( 2 ) construction costs ( 3 ) security costs and ( 4 ) infrastructure costs. As we might have expected, the greatest area of risk was construction costs. It is disturbing to read that, according to Brattle, the 2.0 Bid underestimated construction costs for everything, as much as 90 percent too low in the case of the Media Center. It is equally disturbing to read Brattle’s finding that the major construction — at Widett Circle and the Olympic Village — had no developer committed to doing it, and to read that the costs of construction, in relation to likely financial return (i.e., developer profit) might very well not compute. To read this section of the report is to conclude that the Bid Committee had nothing more solid in its hands than high hopes. That part is unsettling enough. Just as unhappy it is to read the report’s assessment of Bid 2.0’s Infrastructure Plans. The Plans themselves get high marks, but not the available time. The report makes clear that it would have been next to impossible to complete all of the planning, financing, approving, and building of the various transportation segments in anything like the eight years available. Those of us who supported the games Bid felt that the transportation infrastructure requirements, which would also benefit the entire City’s transportation improvement, would not get done in our lifetime but for the time pressure put on them by the Games Bid. The Brattle Report concludes that our strategy was infeasible. For those of us who supported the Games Bid, that is OK; our thought was a shrewd one. For the Bid Committee itself, however, it was regrettable to learn that they allowed supporters to advocate a tactic the Committee knew would not fly. I leave that sentiment as is; however, last night the Boston Bid Committee sharply criticized the Brattle Report, and their rebuttal has legs. Specifically, the Bid Committee notes that the Brattle report erred completely in estimating the Media Center. As the Bid Committee noted,. it wasn’t building a Media Center from scratch but instead retrofitting already existing buildings. thus the Bid Committee;s estimated $ 50 million allocation was NOT 90 percent too low, as charged by the Brattle Report. The Bid Committee also correctly notes that the Brattle Report never mentioned the financials from the last three American games., This omission I noted when first I read the report. The only recent games mentioned by the Brattle Report were the 2012 London games. What happened to Atlanta ? To Salt lake City ? I’m left with the impression that, as to costs, the Brattle Group wanted to describe a kind of worst-case outcome. So let us instead surmise that the Bid Committee would have found developers ready to commit to the Widett and Olympic village developments at available cost prices for available profit. Those are numbers, and numbers can adjust. Not so time. Time is what it is. The Brattle Report’s one undeniable critique asserts quite convincingly that the Bid not have enough time available to complete its preliminaries; and that, therefore, the games could not have happened at all, except, if possible, by an heroic undertaking by everybody in City and State with a damn the costs, damn the approvals, to hell with the procedures attitude. It would have taken the City and State an all hands on deck, crisis level of commitment to thus beat the clock. Could we have don it ? Yes, but not given the division, the confusion, the overlap and disagreements that abounded during the Bid months. Scant wonder that the Mayor refused to commit the City’s finances to a money guarantee of a Bid so likely to not get to the starting line on time. ^ the press wants to know : what will Governor Baker do about the DCF ? Yesterday at the State House, Governor Baker faced an inquisitorial press contingent riled by the latest death of a child in care by the Department of families and Children (DCF). A two-year old child living in a foster home in Auburn, a town suburban to Worcester, had died — this coming barely a week after a seven-year old was removed from a dysfunctional home under DCF observation, in Hardwick — also a town in Worcester County. baker was accompanied by Lieutenant Governor Polito, a Worcester County resident; Dan Bennett, Director of the Department of Public Safety; and Marylou Sudders, who heads the Department of Health and Human Services, of which DCF is a crucial part. Bennett’s task, Baker said, is to conduct a full investigation into the two year old child’s death. But it was Sudders who — along with Baker — faced the most pointed questions. It transpired that the foster home in which the two year old had been placed by DCF had been the subject of “dozens” of 911 calls. How does a home that disrupted become qualified as a foster home under DCF’s foster parent gui8delines ? Evidently DCF’s foster parent background check doesn’t include 911 calls. Sudders assured the press that 911 calls will now be added to those background checks. She then outlined the big DCF conundrum : 100 million $ had been cut from the agency’s budget during the years after 2009, yet now, in 2015, the agency’s caseload has increased by 30 percent and totals the highest number ever. Baker assured the press that “we and the legislature are agreed on adding additional funding to DCF.” As the state now has a surplus, thanks to rigorous financial discipline applied to the FY 2016 state budget, that funding exists — and will surely be provided in the forthcoming FY 2017 state budget. 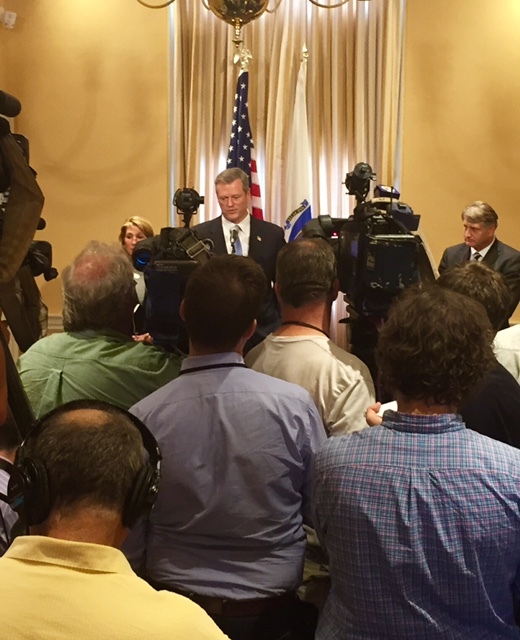 Baker vowed that fixing DCF is now his highest priority. Having spent six difficult months achieving complete reform of the MBTA, Baker now faces at least six difficult months getting DCF right. His DCF Commissioner, Linda Spears, told the Boston Globe, “it’s easier to write a report than to get it done.” How true. Especially with DCF. Fact is, that the DCF most likely can never prevent every tragic outcome for children under its watch. The dysfunctional people that DCF is called to deal with have all kinds of life issues. Many are in addiction. Some are in jail, or newly out of jail, facing going back to jail. Some have craziness issues. Foster homes can be supervised to the moon, but unless DCF social workers come to live 24-07 in a foster home, what goes on in said home most of the time happens without supervision. Much is written about unlicensed social workers, or high caseloads, or foster home certification. All of it merits rigor. But you can hire 10,000 new social workers, and rigor away foster home applicants till there’s almost none, and it will not eliminate tragedy. No social worker can live 24-7 with the 18 families the DCF social worker contract agrees is a caseload limit. No social worker can live 24-7 with even one such family. So what becomes of DCF children during the time that no social worker is watching ? Yes, school personnel and police — as well as others — are mandated by law to report child abuse or neglect; but it takes time to read those reports and to check them out; and who knows if the social worker gets it right ? Often they don’t. Even then, most of such childrens’ lives do not have on the spot supervision. Doubtless Baker, the manager’s manager, will fix what can be fixed of DCF;’s procedures, staffing, and response times. But it will not free DCF from tragedy. Note that many of the recent DCF failures have occurred in Worcester County, a region largely of isolated small towns where people live far away from nearest neighbors. In big cities, people live next door and notice stuff. In much of Worcester County, a dysfunctional home’s social worker visit may be the only occasion that anyone notices anything. And even then, nothing may be noticed. Nothing that Baker can do is going to change this fact.